New Model Extensions for X-POLE Sets using X-JOINT's. Please be careful to choose the correct metal & joint type. There are no screw threads on these extension pieces. A 125mm and 250mm extension are included in the set. Optional extensions are available in 100, 125, 150, 175, 200, 250, 300, 500, 750, 1000 and 1500mm sizes. PLEASE NOTE: if ordering an extension that will be ADDED to the existsing extensions in your set, you may need to purchase an extra X-JOINT as well to connect the poles together. Please contact our sales office on 02 9589 2645 if you need clarification on this. Using the full allowed length of the screw adjuster and both the extensions included in the X-PERT set, this pole will fit ceilings from 2235mm to 2735mm. The poles can be used with ceilings up to 3620mm using the standard upper support dome and optional extensions (purchased separately). 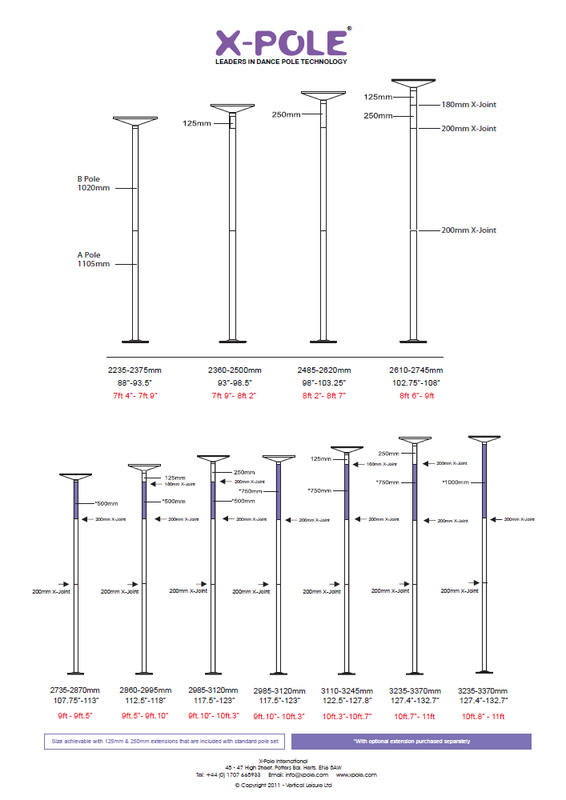 Additional extensions and other optional installation parts can be purchased from your supplier or the X-POLE website. Use the height chart below to work out what extensions you need. The less joints the better, always use a longer extension in preference to multiple shorter extensions if possible. Standard Xpert 45mm was around 5mm too short for out high ceilings. Ordered an extra 250mm extension and she now fits beautifully and is safe and secure. Fast past. Excellent packaging. No extra joints or parts required. Thank you for a pleasant transaction. I measured the pole wrong so when I got my pole, i was just a tad short of touching the ceiling beam. Ordered the extension and it fits perfectly, didn't need to add any of the others or add any extra x-joints. Easy to install.